PLANET FGSW-2620VMP4 Switch features IEEE 802.3af Power over Ethernet (PoE) function which optimizes the installation and safe power management of network devices such as wireless access points (AP), Voice over IP (VoIP) phones and IP surveillance cameras. IEEE 802.3af PoE capabilities reduce installation costs of add-in network productivity devices. It frees the network device deployment from restrictions of power outlet locations. With PoE features, power and data switching are integrated into one unit and delivered over a single cable, which eliminates costs for additional AC wiring and reduces time for installation. It provides a compact, affordable, safe and reliable power solution for small to medium enterprises. 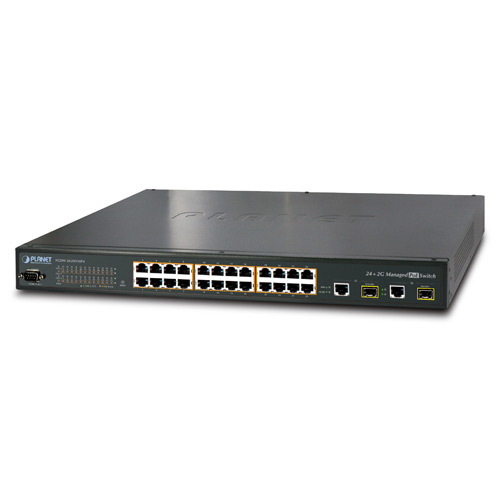 The FGSW-2620VMP4 PoE Managed Switch offers totally 380-watt PoE power budget. The PoE in-line power following IEEE 802.3af standard makes the FGSW-2620VMP4 able to power on 24 PoE compliant devices at the distance up to 100 meters through the 4-pair Cat 5/5e UTP wire. With data and power over Ethernet from one unit, the FGSW-2620VMP4 will reduce cable deployment and eliminate the need for dedicated electrical outlets on the wall, ceiling or any unreachable place. An Ethernet wire carries both data and power bringing the benefits of lower installation costs, fewer installation effort and less need for electricians or extension cords. And the key feature of the solution is energy saving. With more efficient switching power supply, the efficiency of the FGSW-2620VMP4 would be much better than four linear power adapters in a long run. The remote PoE management functions of the FGSW-2620VMP4 make it easy to survey and control the PoE power provision to the devices and ensure interoperability with equipment from other vendors. Via Web interface, SNMP trap and SNMP monitoring, the network manager can get the PoE device status and alert immediately. The over-temperature protection of the PoE Switch offers a safe and stable PoE operating by limiting the output power according to detected temperature in order to avoid destructive breakdown due to unexpected overheating. PLANET FGSW-2620VMP4 offers 24 10/100Mbps Fast Ethernet ports and 2 Gigabit TP/SFP combo ports. The two Gigabit TP/SFP combo ports can be either 1000Base-T for 10/100/1000Mbps or 1000Base-SX/LX through SFP (Small Factor Pluggable) interface. The FGSW-2620VMP4 boasts a high performance switch architecture that is capable of providing non-blocking switch fabric and wire-speed throughput as high as 8.8Gbps. Its two built-in GbE uplink ports also offer incredible extensibility, flexibility and connectivity to the Core switch or Servers. To meet the growing network, PLANET FGSW-2620VMP4 provides console and telnet command line interface, advanced WEB and SNMP management interface. With its built-in Web-based management, the FGSW-2620VMP4 offers an easy-to-use, platform-independent management and configuration facility. The FGSW-2620VMP4 supports standard Simple Network Management Protocol (SNMP) and can be monitored via any standard-based management software. For text-based management, the FGSW-2620VMP4 can also be accessed via Telnet and the console port. Moreover, the FGSW-2620VMP4 offers secure remote management by supporting Secure Socket Layer (SSL) connection which encrypts the packet content at each session. For efficient management, via Web interface the FGSW-2620VMP4 can be programmed for basic switch management functions such as port speed configuration, Port Link Aggregation, IEEE 802.1Q VLAN and Q-in-Q VLAN, Port Mirroring, Rapid Spanning Tree and ACL security. Additionally, the firmware includes advanced features such asIGMP snooping, QoS (Quality of Service), broadcast storm and Bandwidth Control to enhance bandwidth utilization. The FGSW-2620VMP4 offers comprehensive Layer 3 and Layer 4 Access Control List (ACL) to filter out unwanted traffic. Its protection mechanisms comprises RADIUS and Port-based 802.1x user and device authentication. Moreover, the Switch provides MAC filter, Static MAC, IP/MAC binding and Port Security for enforcing security policies to the edge. The administrators can now construct highly secured corporate networks with considerably less time and effort than before. To ensure IP voice and video communication get the quality of service needed, the FGSW-2620VMP4 classifies traffic and prioritizes Layer 2 802.1p or Layer 3 IP DSCP traffic into four hardware queues that support strict or Weighted Round Robin (WRR) queuing algorithms. It also empowers the SMB IP office to take full advantages of the limited network resources and guarantees the best performance in VoIP and Video conferencing transmission. With the business office expansion, the additional telephones required can be installed at less cost via the implementation of PoE IP Telephony system than that of the traditional circuit wiring telephony system. PLANET FGSW-2620VMP4 Managed PoE Switch helps SMBs to create an integrated data, voice, and powered network. PLANET IEEE 802.3af compliant IP phones can be installed without the need of an additional power cables because the power can be provided from the standard Ethernet cable connecting to the FGSW-2620VMP4. PoE IP phones and analog Telephony adapter work perfectly with the FGSW-2620VMP4 which injects power through the Ethernet cables and the IP DSCP priority of QoS feature improves the voice communicating. With the FGSW-2620VMP4, IP Telephony deployment becomes more reliable and cost effective which helps SMBs save tremendous cost when upgrading from the traditional telephony to IP Telephony communications infrastructure. Providing up to 24 PoE, in-line power interface, the FGSW-2620VMP4 Managed PoE Switch can easily build a central power controlled IP phone system, IP camera system, or wireless AP group for the enterprises. For instance, PoE IP cameras can be easily installed in the company for surveillance demands or PoE wireless APs be installed to build a wireless roaming environment in the office. Without the power-socket limitation, the PoE Switch makes the installation of IP cameras or WLAN APs easier and more efficient. While video surveillance system becomes more and more important for visible security in the factory and warehouse, the IP cameras with PoE function would be a lot helpful for the surveillance deployment when the power outlet is not easily found on the ceiling or in the outdoors. For example, in the factory operation or in the warehouse storage security, the PoE IP cameras can be installed anywhere when needed regardless of the restrictions of power outlet location. With the PoE Switch as the central control manager and offering remote power monitoring via Web interface or SNMP trap and SNMP monitoring, the network manager can get the status and alert of PoE devices immediately. The PoE IP cameras can also be controlled remotely, which increases the administrator management efficiency and improves the productivity.